^ 1.0 1.1 Marvin Camras (ed.). 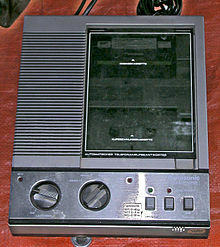 Magnetic Tape Recording. Van Nostrand Reinhold. 1985. ISBN 0-442-21774-9 （英语）. ^ 2.0 2.1 2.2 Eric D. Daniel, C. Dennis Mee, Mark H. Clark. Magnetic Recording: The First 100 Years. 电气电子工程师协会. 1999. ISBN 0-7803-4709-9 （英语）. 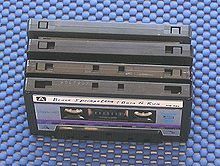 ^ Part 7: Cassette for commercial tape records and domestic use. IEC 60094-7: Magnetic tape sound recording and reproducing systems. 国际电工委员会, Geneva （英语）. ^ Vintage Audio History. Video Interchange. [2010-04-05] （英语）. ^ RCA Cartridges: 1958 - 1964. Diana Cook. [2010-04-05] （英语）. ^ David Morton. Sound recording: the life story of a technology. Greenwood Publishing Group. 2004: 161 （英语）. ^ John Shepherd. Continuum encyclopedia of popular music of the world. Continuum International Publishing Group. 2003: 506 （英语）. ^ Hans-Joachim Braun. Music and technology in the twentieth century. JHU Press. 2002: 161 （英语）. ^ WM-10. Tim Jarman and Nick Jarman. [2010-04-05] （英语）. ^ Paul du Gay, Stuart Hall, Linda Janes, Hugh Mackay, Keith Negus. Doing Cultural Studies: The Story of the Sony Walkman. Sage Publications Ltd. 1997. ISBN 0-7619-5402-3 （英语）. ^ Robin James. Cassette Mythos. Brooklyn, NY: Autonomedia. 1992. ISBN 0-936756-69-1. ^ 1989年6月3日 伊朗最高精神领袖霍梅尼病逝. 中国网. [2010-04-05] （中文）. ^ Peter Manuel. Cassette Culture: Popular Music and Technology in North India. University of Chicago Press. 1993. ISBN 0-226-50401-8 （英语）. ^ 18.0 18.1 Not long left for cassette tapes. BBC. 17 June 2005 [2010-04-05] （英语）. ^ Record and prerecorded tape stores. Gale Encyclopedia of American Industries. 2005 [2010-04-05] （英语）. ^ 20.0 20.1 Janine Stoll. The Dynapak Difference. The Indie Voice. 2000 [2010-04-05]. （原始内容存档于2007-10-18） （英语）. ^ Marc Hogan. This Is Not a Mixtape. Pitchfork Media Inc. 2010-02-22 [2010-04-05] （英语）. ^ 472 Studio Audio Cassette IEC Type II. National Video Tape LLC. [2010-04-05]. （原始内容存档于2004-12-30） （英语）. ^ Scotch High Energy. Project C-90. [2010-04-05] （英语）. ^ Werner Abelshauser, Wolfgang von Hippel, Jeffrey Allan Johnson, Raymond G. Stokes. German Industry and Global Enterprise: BASF: The History of a Company. Cambridge University Press. 2003: 585. ISBN 0-521-82726-4 （英语）. ^ The Blank Tape Gallery. The BTG. [2010-04-05] （英语）. ^ Compact Cassette. Philips Historical Products. [2010-04-06]. （原始内容存档于2010-07-11） （英语）. ^ Chris Walton. 2010 Buick LaCrosse vs. 2009 Lexus ES 350 Comparison Test and Video. Inside Line. 2009-08-28 [2010-04-05] （英语）. ^ Steve Fluker. Trends in Technology: Recording Sound. [2010-04-05] （英语）. ^ Analysis of an SDR Cassette Tape. Toomas Losin. [2010-04-05] （英语）. ^ Bruce Springsteen's "Nebraska" - A PortaStudio, two SM57's, and Inspiration. TASCAM. [2010-04-05]. （原始内容存档于2010-05-27） （英语）. ^ CBS Songs Ltd and Others v Amstrad Consumer Electronics Plc and Another. Intellectual Property Office. [2010-04-05]. （原始内容存档于2011-01-17） （英语）. ^ C.B.S. Inc. and C.B.S. United Kingdom Limited (suing on behalf of themselves and on behalf of and as representing all other members of the British Phonographic Industry Limited) v. Ames Records and Tapes Limited. Reports of Patent, Design and Trade Mark Cases. 1981, 98 (25): 407—428 （英语）. ^ Caryn Brooks. Mix music with the Personics System. The Daily Collegian. 1990-06-12 [2010-04-15]. （原始内容存档于2010-04-20） （英语）. ^ Hewlett-Packard HP 9830 Calculator/Computer. hp9830.com. [2010-04-05] （英语）. ^ Lennart Benschop. BASICODE. [2010-04-05] （英语）. ^ Al Fasoldt. Sony Unveils the Minidisc. The Syracuse Newspapers. 1991. （原始内容存档于2009-08-23） （英语）. ^ Cassette vs. Digital. J&R Product Guide. [2010-04-05]. （原始内容存档于2007-09-28） （英语）. ^ Phonograph records and prerecorded audio tapes and disks. Gale Encyclopedia of American Industries. 2005 [20 September 2006]. ^ The Rome MP3 Player (32Mb Version). Target PC. [2010-04-05] （英语）. ^ C@MP CP-UF32/64 a New Portable Mp3-Player Review. Fastsite. 2000 [2010-04-05]. （原始内容存档于2010-09-14） （英语）.